In this tutorial, we'll explain how to monitor your sprints and epics using burndown charts in Jira Software. You're working in a project on Jira Software, and you want to track the progress of a sprint, or epic. You have created a Jira Software account, and a Jira Software Scrum project. You're familiar with the basics of Scrum, and epics. What is a burndown chart? A burndown chart shows the amount of work that has been completed in an epic or sprint, and the total work remaining. Burndown charts are used to predict your team's likelihood of completing their work in the time available. They're also great for keeping the team aware of any scope creep that occurs. If you notice that the team consistently finishes work early, this might be a sign that they aren't committing to enough work during sprint planning. If they consistently miss their forecast, this might be a sign that they've committed to too much work. If the burndown chart shows a sharp drop during the sprint, this might be a sign that work has not been estimated accurately, or broken down properly. What is an estimation statistic? The estimation statistic is the unit of measurement your team will use to estimate work. 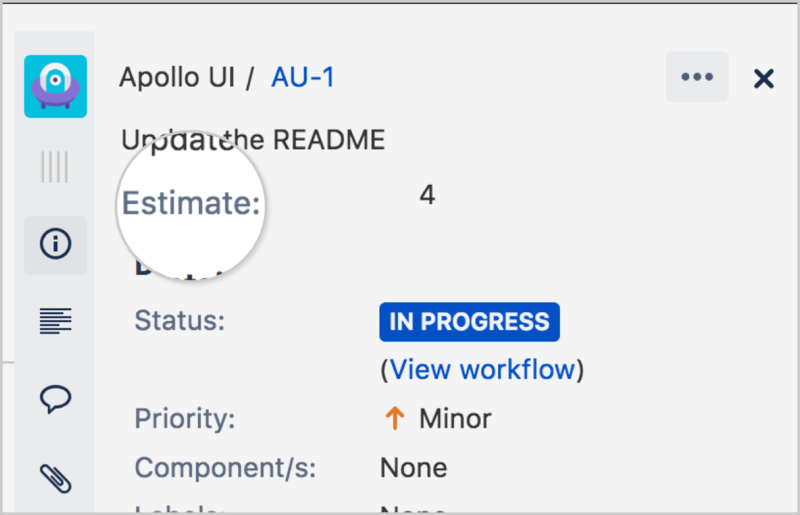 In Jira Software, you can measure work using story points, hours, or you can come up with your own statistic. The estimation statistic is important because it's used to calculate team velocity. For each sprint, the velocity is the sum of the Estimation Statistic for completed stories. If your team is consistent with its velocity, you can use it to determine how much work they can take on in each sprint, which is useful for sprint planning. Navigate to the board or backlog, then select more ( ) > Board settings. Which estimation statistic should we use? Traditionally, software teams estimated their work in a time format using days, weeks, and months. However, many agile teams have transitioned to story points. If you're new to agile, or not sure which one to pick, we recommend using story points. What's the difference between estimation and tracking? In agile, estimation refers to measuring the size of a team's backlog, or an individual piece of work. Tracking refers to using those estimates to ensure work is on-track for completion. In your Scrum project, select an issue either on your board, or in the backlog. In the issue details, click the Estimate field. Can I change an estimate after it has been entered? In short, yes you can. But if you change the Estimate value after a sprint has started, it'll show up as a scope change in the burndown chart. If you're finding it hard to estimate issues, that's totally normal! Check out our estimation guide for tips and tricks on finding the right estimates for your issues. This report shows the amount of work to be done in a sprint. It can be used to track the total work remaining in the sprint, and to project the likelihood of achieving the sprint goal. By tracking the remaining work throughout the sprint, a team can manage its progress, and respond to trends accordingly. For example, if the burndown chart shows that the team may not reach the sprint goal, then they can take the necessary actions to stay on track. Navigate to your scrum project. Select the Backlog or Active sprint. Click Reports, then select Burndown Chart. Estimation statistic: The vertical axis represents the estimation statistic that you've selected. Remaining values: The red line represents the total amount of work left in the sprint, according to your team's estimates. Guideline: The grey line shows an approximation of where your team should be, assuming linear progress. If the red line is below this line, congratulations - your team's on track to completing all their work by the end of the sprint. This isn't foolproof though; it's just another piece of information to use while monitoring team progress. See how quickly your team is working through the epic. See how work added/removed during the sprint has affected your team's overall progress. Predict how many sprints it will take to complete the work for an epic, based on past sprints and changes during the sprints. Click Reports, then select Epic Burndown. Select an epic from the dropdown next to the Epic Burndown header. You'll be able to choose from epics that are in projects configured for your board, via the board's filter. Epic menu: Select which epic to view data for. Work added: The dark blue segment shows the amount of work added to the epic in each sprint. In this example, work is measured in story points. Work remaining: The light blue segment shows the amount of work remaining in the epic. Work completed: The green segment represents how much work is completed for the epic in each sprint. Projected completion: The report projects how many sprints it will take to complete the epic, based on the team's velocity. If you're looking for more info on estimating work, check out our guide on Story points and agile estimation. If you're looking for info on the Release burndown chart, check out our guide on Versions. For more detailed information on Jira Software's sprint burndown chart, check out our Burndown chart documentation. For the epic burndown chart, check out our Epic burndown chart documentation. For more information on metrics for your agile team, check out our Metrics guide. For more information on driving a Scrum project in Jira Software, check out our How to do scrum with Jira Software guide.